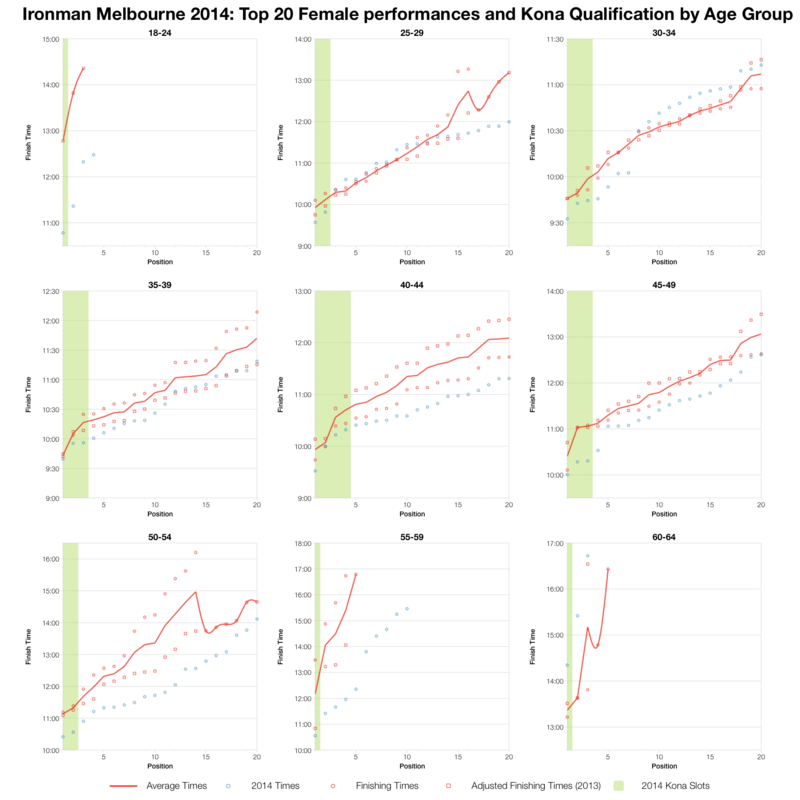 I hate to say I told you so, but I did predict that Ironman Melbourne would be a fast and competitive race for the Kona slots. Admittedly this was a pretty safe bet. From a broad perspective this year’s race was comparable with the inaugural 2012 event, but at the front of the age group field this year’s times were faster. 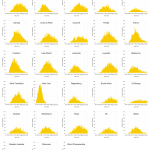 If I place the split distributions from 2012 and 2014 side-by-side what’s immediately clear is that they have remarkably similar distributions. 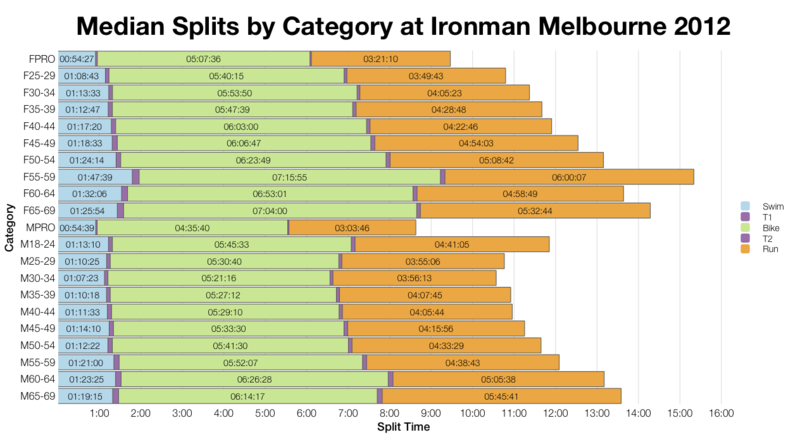 Not identical: swim times are a little more sharply focussed around the 1:05-1:10 mark and the peaks of the bike and run distributions are slightly wider, but generally the charts are the same. From the top level it would appear that 2014 followed a very similar race day pattern to 2012. The medians from these 2 years present a slightly different picture. 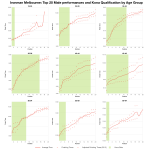 In the pro field times (with the exception of the women’s swim) average faster in 2014 than in 2012, but in the age group ranks the trend goes the opposite way – the average times, with the exception of the swim, are generally a little slower. 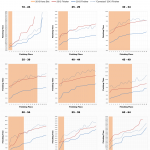 It should be noted that the difference is not always significant nor is it consistent across all age groups. 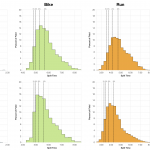 Clearly though for all the similarities in the distributions at an age group level there are differences to note. 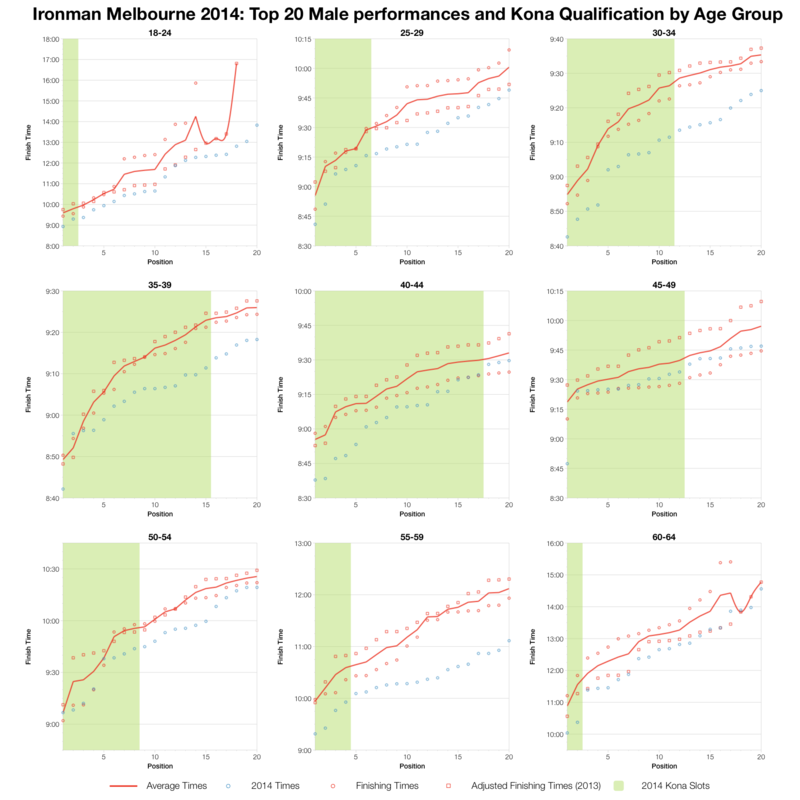 This is particularly true once we look at the front-of-pack age groupers to see Kona qualification times. As in my pre-race analysis I’ve incorporated adjusted 2013 times for comparison. What’s striking here is the number of this year’s finishers, in blue, posting faster times than in 2012. It’s reasonable to say that for the most part qualifying times were quicker this year. So, while the overall picture looks the same and the medians suggest elements of the race were slower the front-of-pack is, if anything, faster. 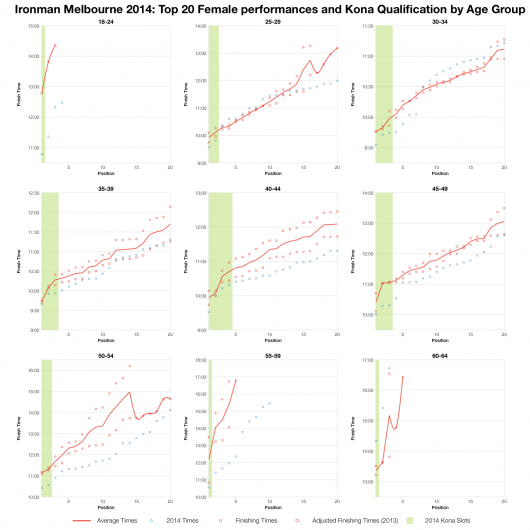 I observed a similar pattern at Ironman New Zealand a few weeks back. 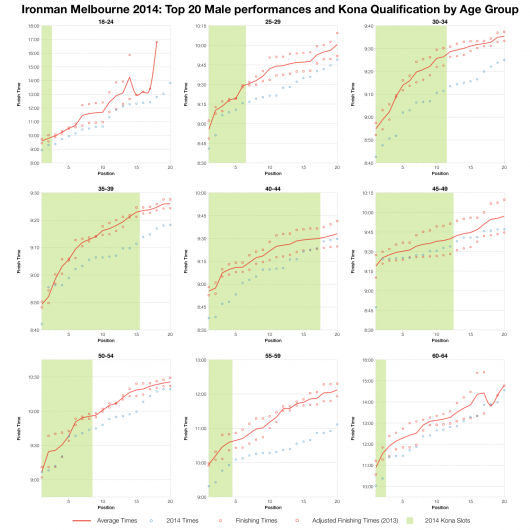 As with that race I’d speculate that the field is increasing in size and broadening in ability and while we may be seeing faster racing at the front of the age groups this is not a universal trend among amateur athletes. From the perspective of those chasing Kona slots it’s what’s happening at the front-of-pack that matters. 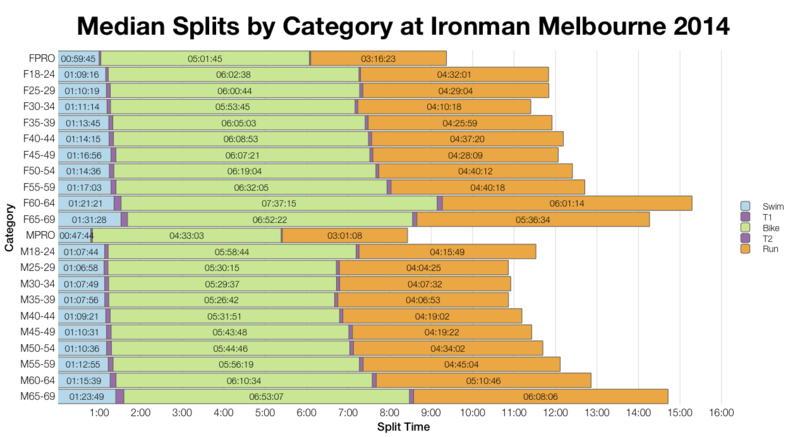 As usual I’ve uploaded a spreadsheet of the results with full splits for Ironman Melbourne 2014 to Google Drive.